Applicants must be gentle, loving and enjoy long strolls through the desert. Good news for those of you who didn't get to play Flower, Flow, and Journey because you don't own a PS3. No, those three games aren't being ported, unfortunately. But now that developer, Thatgamestudio's, three-game deal with Sony is over, the developer is now free to create games for other platforms. "It takes us a little bit of time to basically readjust after the three game deal. We're very close in figuring out what the next deal is," founder, Jenova Chen, told VG247. "We're negotiating with various partners, so maybe within the next month, we'll be able to determine which is the [right deal]." "In terms of when you'll know about the next game, I think we intentionally announce our games very early," he continued. "We announced Flower half a year after we launched Flow. We announced Journey half a year after we launched Flower. So hopefully within this year, you'll hear from us about our next game." Despite the PSN exclusivity, Chen says the deal he made with Sony was great for the company, and that without it Journey might never have been made. 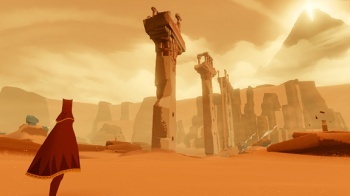 "If it wasn't for Sony's deal, I don't think we'd be ever to get into a situation to make a game like Journey because Journey is so far the largest budget for a PSN game and there is some money spent on marketing for Journey and I think that's the first time in history," he said. "If it weren't for the three-game deal, we would not have the luxury to be able to build this game. It's much larger and a more expensive game and it took us three years to make. Internally, we're calling Journey the AAA PSN game." Thatgamecompany is set to announce a new game this year.